Das erstmals im 19. Jahrhundert untersuchte Lukasgrab südöstlich des Staatsmarktes von Ephesos wurde wegen eines kaiserzeitlichen Reliefs mit der Darstellung eines Zebus samt sekundär eingetieftem Kreuz über dem Buckel des Tieres zunächst als Grabanlage des Evangelisten bezeichnet. Aufgrund weiterer Forschungen wurde schließlich eine Interpretation als römisches Heroon oder als Tempel favorisiert, der in frühbyzantinischer Zeit zu einer Kirche umfunktioniert worden sein soll. Dieses Bild ist allerdings nach den Untersuchungen der Jahre 1997 bis 2004 großteils zu revidieren. Bei dem Rundbau handelt es sich vielmehr um eine Brunnenanlage, die im 2. Jahrhundert nach Christus inmitten eines von Säulenhallen eingefassten Marktplatzes errichtet worden ist. The so-called tomb of St. Luke that is situated to the southeast of the State Agora of Ephesus was investigated for the first time in the 19th century. Because of a relief from the Roman Imperial period showing a zebu with a secondary engraved cross above its hump, the monument was initially called the tomb of the evangelist. Further examinations led to it being interpreted as a Roman heroon that in early Byzantine times was then rebuilt as a church. Due to the results of new investigations undertaken since 1997, this picture has had to be revised. In fact, the rotunda has turned out to be a fountain from the Roman Imperial period, which was erected in the centre of a marketplace surrounded by columned halls. In the 5th century, the fountain was adapted to accommodate a church. Several architectural clues point to it having been commemorative church, and it possibly played an important role in Ephesus as a pilgrimage site. This study summarizes the results of new investigations undertaken by the author from 1997 to 2004, with special attention being paid to the Imperial-period monument as well as its later use, including its various stages of remodelling and decorating. The sometimes complex findings are elucidated through a large number of photographs and drawings. 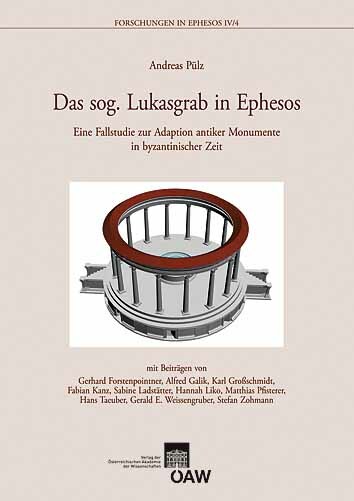 The volume also includes contextual analyses of the findings, which were conducted by S. Ladstätter and H. Liko (ceramics), M. Pfisterer (numismatics), K. Großschmidt and F. Kanz (anthropology), H. Taeuber (epigraphy) and G. Forstenpointner, A. Galik, G. E. Weissengruber and S. Zohmann (archaeozoology).